If you’re in the NYC area, we hope you’ll mark your calendar; if not, we have some free listening for you to explore below. Hacking and inventing, creative musicians are making and modifying the tools of their performance to express the music they imagine, with stunning variety of results. And so it is that once a month (erm, more or less), we get together in Manhattan to celebrate music makers at a little thing we call Handmade Music. This month, experimental sound systems and Afrotronic future funk with new electronic instruments inspired by west African tradition join the lineup. Bring your project to work on, or just hang out and see what others are producing. At 5 PM, Todd Michael Bailey will show off his Where’s the Party At 2 open, DIY sampler, which takes inspiration from grungy digital samplers past. Afrotronic future funk band! Electronic, handmade remixes of traditional African instruments like the “the Gongo~Tron,” based on the traditional “Gongoma,” a Guinean m’bira (thumb-piano), and “Nano-Shakerator,” based on the traditional “Shekere,” a percussion instrument found throughout western Africa. All in grooving, futuristic new combinations! CONCRETE SOUND SYSTEM live sound set (David Primus Luta Dodson). I could try to put into words what David does, but it’s best to see in the video above, from Manhattan’s Harvestworks sound and music research center. 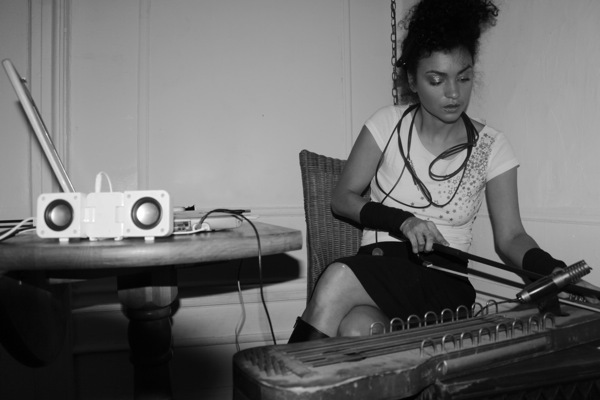 SAPHRYN PHOLLICLE (STEF EYE, Saturn Never Sleeps), multi-instrumentalist, singer, and sound experimentalist plays a left-field live set. Kris Keyser is already a favorite of spectacular 8-bit LSDJ music, here accompanied by live-generated visuals on vintage game consoles by this talented digital artist and inventor. ALEX KIEFER (exilefaker) Forward-thinking chip music from a man also working toward a PhD in philosophy. The chip philosopher? Believe it. And she has an experimental Zaturn Blend podcast. 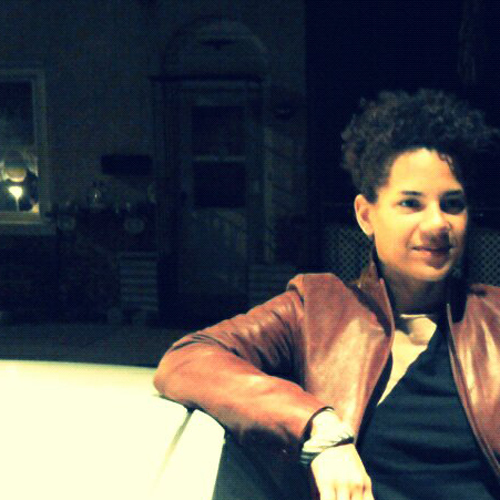 Rucyl Mills, pictured above, has her music up on her endlessly-inspiring blog. I can’t embed it, but I absolutely adore the sound of the Yesterday’s Machine preview; I promise to make sure Rucyl keeps us posted on its release. See also Rucyl’s rig, at bottom. From our last edition, Chris Gilroy (on the docket this time, too) joins Philippe “Flippy Lesaux,” as documented in video by Thomas Piper. And finally, in addition to one more video below, some SoundCloud-hosted tracks from Digital Diaspora, including Mikel Banks on vocals and “freakaphone” (“Looking Back”) and Janice Lowe on vocals (“Sing With Me”). 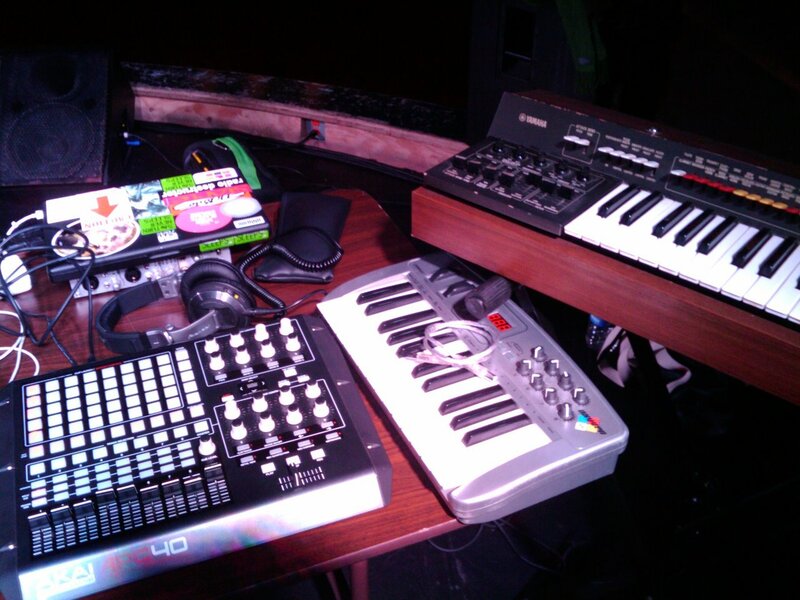 Rucyl’s live rig. She and Stef Eye will both be representing label / live act Saturn Never Sleeps.